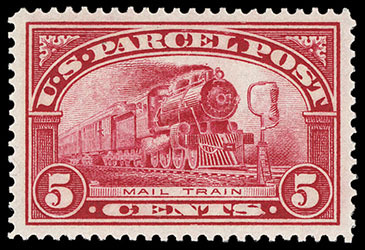 Parcel Post, 1913, 1¢ carmine rose, o.g., never hinged, precise centering and exceptional margins, rich deep color, Superb; with 2008 P.S.E. certificate Graded (Superb 98, SMQ $600). 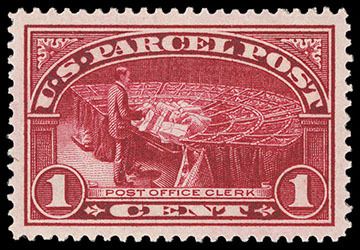 Parcel Post, 1913, 1¢ carmine rose, o.g., never hinged, exceptional centering within large balanced margins, intense color, Superb; with 2008 P.S.E. certificate Graded (Superb 98, SMQ $600). Parcel Post, 1913, 4¢ carmine rose, o.g., never hinged, large balanced margins and precise centering, rich vibrant color, an Extremely Fine to Superb jumbo, a stunning mint gem; with 2012 P.S.E. certificate Graded (XF-Sup 95J, SMQ $1,000). 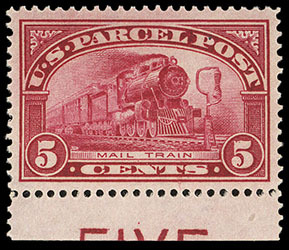 Parcel Post, 1913, 5¢ carmine rose, o.g., never hinged, choice margins and centering, rich color on bright paper, Extremely Fine to Superb; with 2008 P.S.E. certificate Graded (XF-Sup 95, SMQ $600). 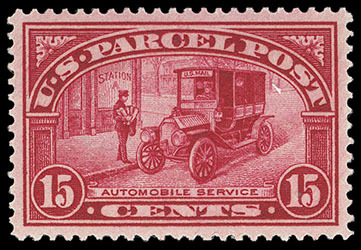 Parcel Post, 1913, 5¢ carmine rose, bottom margin single with part imprint, o.g., never hinged, choice centering, striking intense rich color, Extremely Fine to Superb; with 2012 P.S.E. certificate Graded (XF-Sup 95, SMQ $600). 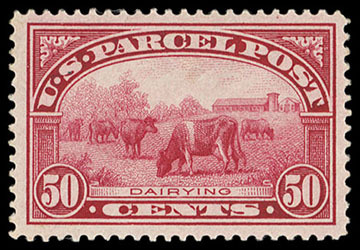 Parcel Post, 1913, 15¢ carmine rose, o.g., never hinged, deep intense color, precision centering within well balanced margins, Extremely Fine and choice, a stunning fresh gem. 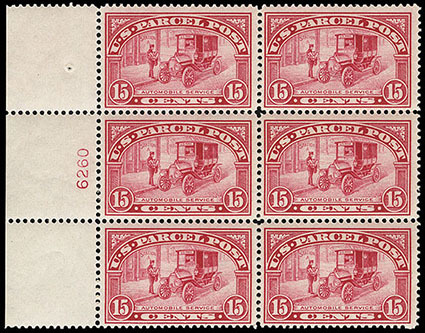 Parcel Post, 1913, 15¢ carmine rose, left margin plate no. "6260" block of 6, o.g., bottom right stamp neatly hinged, others never hinged, attractively centered, rich brilliant color and very fresh, Very Fine, choice so nice. 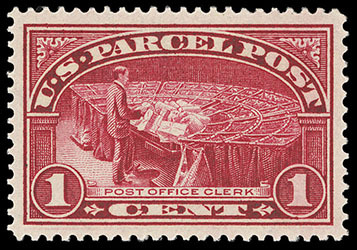 Parcel Post, 1913, 20¢ carmine rose, left margin plate no. "6192" block of 6, full o.g., few hinge reinforcements, nice overall centering, bold color and remarkable freshness, Very Fine. 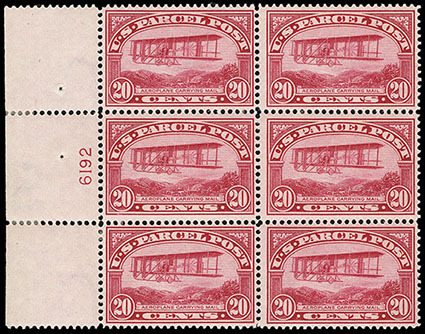 AN ATTRACTIVE AND SCARCE PLATE BLOCK OF THE 20¢ PARCEL POST ISSUE. 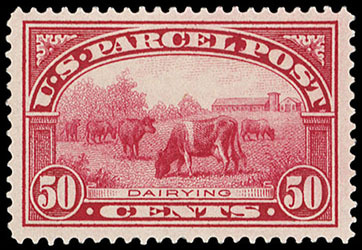 Parcel Post, 1913, 50¢ carmine rose, o.g., lightly hinged, large margins and exceptional centering, rich radiant color, Extremely Fine to Superb, striking Parcel Post issue; with 2003 P.S.E. certificate Graded (XF-Sup 95, SMQ $600). 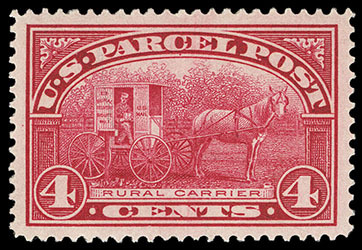 Parcel Post, 1913, 50¢ carmine rose, o.g., very lightly hinged, perfectly centered amid wide margins, rich radiant color, an Extremely Fine gem.